Remember, remember the 5th of November… but hopefully for all the right reasons! Fire accidents can happen anywhere – in the home, at work or outdoors – whether it’s from a dropped match, a sparkler or a rogue firework. Minimise the risk of a fire breaking out at your home or workplace by flameproofing your soft furnishings. At Apple Clean, we have specialist fire retardant products for curtains, upholstery and linings. We offer upholstery and curtain fireproofing to commercial clients with all types of premises. This includes schools, hospitals and nursing homes, stage curtains in village halls and theatres, upholstered seating in cinemas and other entertainment centres, hotels, restaurants, offices and business premises, and much more. All commercial premises have to comply with stringent regulations for fire safety which includes flameproofing upholstery and curtains. Instructing the professional team at Apple Clean will ensure that your business is fully compliant. For our domestic customers, upholstery and curtain flameproofing services can be carried out at the same time as curtain, upholstery and carpet cleaning, if required. 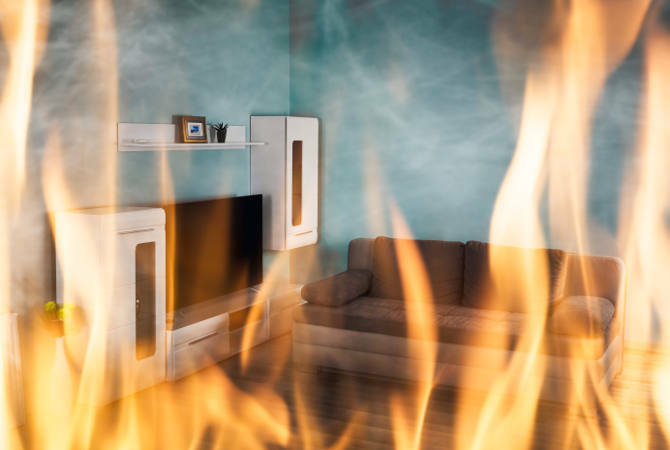 The Fire Safety Advice Centre has a good overview of how the Furniture and Furnishings (Fire Safety) Regulations 1988 (as amended in 1989, 1993 and 2010) must be implemented by manufacturers and suppliers of upholstered items and what this means for the levels of fire resistance in your home. Why choose Apple Clean flameproofing? We offer flameproofing services that meet strict local authority standards. Our team can apply high quality fire retardant products to upholstery and curtains in situ. Our fireproofing service is available at a time that is convenient to you, minimising disruption. We can even provide out-of-hours upholstery and curtain fireproofing services. We charge very competitive rates for flameproofing domestic and commercial premises. All our technicians are Clean Trust trained, fully insured and CRB checked. Apple Clean has 25+ years’ experience of protecting curtains and upholstery. Whether you wish to protect your business, staff and customers or keep your family and home safe, Apple Clean’s fireproofing services are designed to give you the necessary peace of mind. Why not give us a call on 0800 587 4571 to find out how exactly we can help?